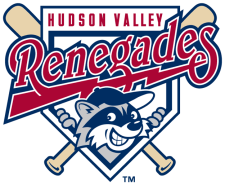 The Hudson Valley Renegades scored first, but a late inning rally could not lead them to victory as they fell to the State College Spikes 4-3 on Sunday at Medlar Field. The game remained scoreless until the sixth inning when the Renegades reached the scoreboard. Chris Winder drew a walk then stole second. Nicholas Schwaner drove home the run with an RBI single to center, scoring Winder and giving them a 1-0 lead. State College answered with three runs of their own in the seventh. Matt Curry doubled to left followed by a walk to Justin Bencsko. Kelson Brown drove home both runners with a triple to right. Brown would later score on a sac fly by Kyle Saukko to give them a 3-1 lead. The Spikes added another run an inning later. Curry doubled to right then advanced to third on a wild pitch. Curry would then score on a sac fly by Gerlis Rodriguez to advance the lead to 4-1. The Renegades rallied in the top of the ninth. Philip Wunderlich reached on an error, followed by a walk to Schwaner to put runners on base. Robby Price drove home two runs with a double to right. But the tying run would be stranded in scoring position and the Renegades took a 4-3 loss. Nate Garcia pitched 4 shut-out innings, allowing 2 hits with a strikeout and 2 walks. Julius Dettrich suffered the loss, allowing 4 runs on 4 hits with a strikeout and 2 walks. The Renegades face off against the Spike again on Monday at Medlar Field. Wilmer Almonte (0-2, 4.40) will pitch against Brooks Pounders (1-2, 4.15).